Senator Charles Schumer (D-NY), Permanent Minority Leader. There are good, sound reasons why Democrats in Congress might want to cut some deals with Donald Trump. Maybe they can persuade him to stay in the Paris climate accords, or to preserve Obamacare with some tolerable revisions, in which case giving him bipartisan cover might be worthwhile. But Charles Schumer, the Senate Majority Leader, seems to have a completely misguided understanding of how the calculation works. Obviously Schumer is not providing candid accounts of his political strategy to the public. But a series of reports from Democrats who have spoken with him paints a consistent account of a leader who thinks his party’s best chance of survival lies in working with Trump. Senate Democrats work with Trump → Voters conclude Senate Democrats are doing a good job → Senate Democrats win reelection. Yet both empirical research and recent experience show that this dynamic, which seems to make sense, does not actually work at all. The truth is that voters pay little attention to legislative details, or even to Congress at all. They make decisions on the basis of how they feel about the president, not how they feel about Congress. And a major factor in their evaluation of the president is the presence or absence of partisan conflict. If a president has support from the opposition party, it tells voters he’s doing well, and they then choose to reward the president’s party down-ballot. This dynamic played out during George W. Bush’s first term. After 9/11 — an extraordinary event, to be sure — both parties rallied around Bush. This caused his approval ratings to skyrocket, and as a result, Democrats in Congress suffered an unusual beating in the 2002 midterm, which ordinarily would have been an opportunity for the opposing party to record gains. Indeed, the bipartisan halo around Bush persisted long enough to let him win reelection in 2004. Only in Bush’s second term, when partisan cooperation collapsed, did Democrats make major gains. 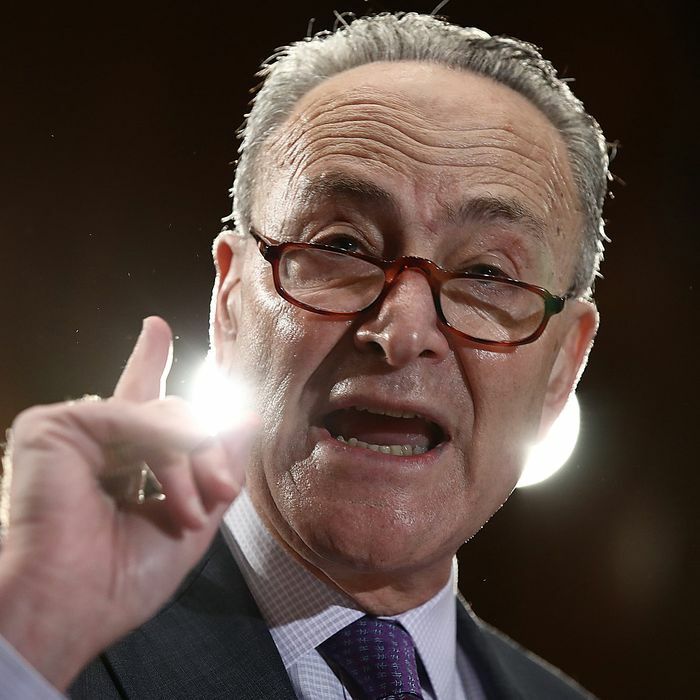 If Schumer wants to prevent bad outcomes, he might cut some deals with Trump. But those deals are going to put his members at risk. If he wants to protect his red-state seats, he needs to drive down Trump’s approval ratings, which means fighting Trump on everything. It’s unfortunate for the Democratic Party that its most powerful elected official does not seem to understand the basic political dynamic.